Rotary was founded in Chicago, Illinois in 1905 by Paul P. Harris and 3 of his friends. It was the world's first service club organization. They called it "Rotary" because in the beginning, they rotated meetings from one member's office to another. Rotary is non-political and non-sectarian and became an international organization in 1911. For more information, visit the Rotary International web site. 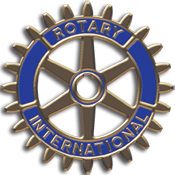 Our Rotary Club was chartered on March 8, 1971 with 25 members. Our club (#4232) is a part of District 6890 which includes Hardee, Highlands, Hillsborough and Polk Counties.